Avatar goes far beyond simple entertainment, transporting audiences to an exotic new world in a bold new way. It’s a film that must be seen in 3D. Yes, if you see Avatar in 3D, you’ll have experienced something that’s not just groundbreaking, but could very well change the way you watch movies. Of course that’s what James Cameron set out to do, wasn’t it? He’s been talking about it for years. That this early proponent of digital 3D cinema succeeds here is astonishing enough. But that he does it in such a glorious fashion is a testament to his skill as a filmmaker and to the power of the medium. From the moment we first see the bioluminescent Pandoran landscape, we’re willing to go anywhere Cameron, this master of film entertainment, wants to take us. We also completely understand Jake Sully’s (Sam Worthington) transformation from an obedient grunt into the warrior savior of the Na’vi, Pandora’s indigenous race of 10-foot blue humanoids. Sully travels to Pandora after his identical twin brother is killed, leaving behind an big blue avatar that only a genetic duplicate can control. Sully doesn’t have the education or avatar training that his brother did. But the mining company, which shelled out loads of cash for the program in hopes of convincing the Omaticaya tribe to get out of its way, is happy to have the paraplegic ex-marine take over in a pinch. Grace (Sigourney Weaver), the scientist who “literally wrote the book” on the Na’vi people and heads the avatar program, isn’t hot on having a jarhead in her group. And with good reason. Col. Miles Quaritch (Stephen Lang), the company’s head of security, just wants to bomb the hell out of the savages and recruits Sully to provide inside information on the Omaticaya’s Hometree, a towering tree that sits atop the richest mineral deposit on Pandora. Grace doesn’t count on Sully’s military experience making him the perfect man to learn the warrior ways of the Omaticaya tribe. And Quaritch doesn’t count on Sully going native when he learns the essence of the Na’vi people and their connection with Pandora from Neytiri (Zoe Saldana). The plot, which even before the release was unflatteringly compared to both Fern Gully and Dances with Wolves, isn’t revolutionary. The characters are also monumental cliches. James Cameron, however, is a man who knows his strengths and weaknesses, even if those weaknesses resulted in 11 Academy Awards for 1997’s Titanic. The difference between Titanic and Avatar is simple. Cameron’s one-dimensional characters connect because the world he puts them in is so vivid and so inviting. Like Oz, Hogwarts, or that galaxy far far away, we find ourselves caring about the characters precisely because of the world they exist in, flaws be damned. While the textured, almost tangible, 3D representation of Pandora makes the landscape burst to life and the action more enthralling, Cameron’s “performance capture” technology goes beyond anything we’ve seen before. The creepy, glass-eyed characters from Robert Zemeckis’ numerous motion capture movies are instead fully realized creations here. Had the captured performances of Saldana, Weaver, Worthington and the countless actors who played the Na’vi people conflicted with the setting, Avatar would have failed. Even when live-action humans share the screen with the Na’vi, we aren’t thrust out of the fantasy. Most importantly, we never want to remove ourselves from it. When the final credits rolled, and I realized that I wasn’t on Pandora anymore, only one thought ran through my head: I have to go back. I never felt that way about Middle-earth after watching The Lord of the Rings films. Even the most recent Harry Potter movie didn’t demand a return visit to the Wizarding world. Whether Avatar will be the pop phenomenon other great sci-fi/fantasy epics have become remains to be seen. But judging from the massive applause the film received at the screening I went to yesterday, I would bet I’m not the only one who desperately wants to return to Pandora. 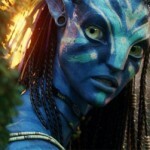 Avatar, starring Sam Worthington, Zoe Saldana, and Sigourney Weaver, directed by James Cameron, is now playing. It has been 12 years since Cameron unleashed the phenomenon that was Titanic and real fans would have to look as far back as 1991’s Terminator 2 for their last proper dose of his incredibly epic action (True Lies, while fun, really doesn’t count). So the anticipation for Avatar has long since reached fever pitch and beyond. Thankfully for the patient masses, Avatar has turned out to be the biggest and best event movie of the year, perhaps the decade. The story is pure Cameron simplicity – a paraplegic ex-marine is given a chance to walk again through the use of a unique alien body, called an Avatar. It is his job to gain the trust of the natives so that a greedy corporation can steal the precious metal from their lush moon. Jake’s (Sam Worthington) crippled main character is the perfect point of contact for the audience – not only is he new to the visual delights of Pandora but his disability means that every moment in his Avatar body is one of glorious freedom from the confinement of his chair. When the Corporations intentions become more sinister, Jake must choose between his new found place with the natives and his own race and fight for what he believes in. Avatar combines parts of Pocahontas and Braveheart with a liberal dose of Space Marines into an epic whole that takes nearly three full hours to unfold. We could criticise that length, the weak story and the hammy dialogue. We could attack its thinly-veiled ecological message or the frankly bizarre spirituality in its second half but honestly nothing can spoil the experience while you are enveloped in it. And a large part of that is down to the brilliant use of 3D – which is both subtle and incredibly effective. 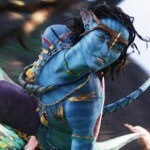 Til now, we have been making movies with 3D elements, Avatar is the first truly 3D film and might well prove to be one of the most significant things to happen to blockbuster film-making since Star Wars. Cameron is also pushing the envelope with truly photo-real CG – something which has been promised for years but has finally been delivered with Avatar. The interactions of the characters with the environment is incredible and the detail on the faces of the motion-captured leads (Worthington and Star Trek’s Zoe Saldana) bring them to life. You will believe totally in their performances, representing another quantum leap in tools which have rarely been used for anything other than spectacle. Make no mistake, Avatar is an important film from a technical standpoint but it is also great entertainment. The world of Pandora is a stunning spectacle from scene to scene and as Jake learns more about the Na’vi the film approaches the kind of light hearted adventure story which has been absent from movie theatres for years. Then the final act explodes into tragedy and desperate action, with the final half hour a blistering life or death struggle that has to be seen to be disbelieved. Over the coming days you will be hearing a lot about Avatar, and some of the critical reaction is bound to focus on its weaknesses in a bid to appear appropriately reserved and objective. But this is not a film to be dissected or examined, rather one to be experienced with a warm crowd, a great sound system, in 3D as you bask in the knowledge that the movie-making master is back!